Joy Creek Photo Archive (c) all rights reserved We grow Allium senescens ssp. montanum var. glaucum along our sunny Lavender Walk. Although the flowers make showy, rounded globes, it is the foliage that interests us most. The flattened and somewhat twisted grass-like blades are blue green and form an attractive swirling pattern that enlivens this area for a long time. 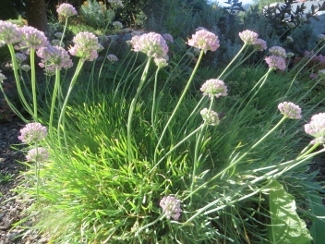 The foliage has a light onion scent, which makes it resistant to browsing by deer. July to August. 6 in. x 1 ft.